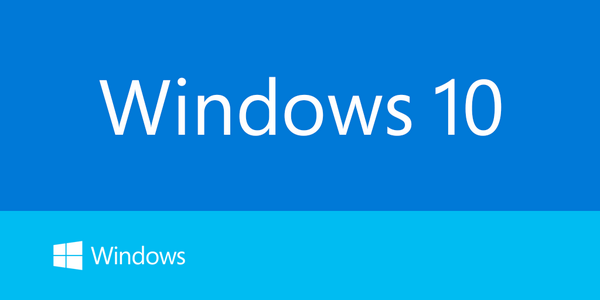 Yesterday, Microsoft announced its latest iteration to the famous operating system, named Windows 10. It’s quite an interesting take on the future of the software giant because it packs a few adjustments and tweaks that are modeled at creating a fresh and livened up Windows experience. The first thing you’d realize is that Microsoft skipped a number in the naming. I’m still not sure why they did this but it feels like they just want to keep an even numbering to the OS (or it could just be an excuse to create puns). With Windows 8, Microsoft was looking to bring Windows to a more touch friendly interface and it didn’t quite bode well with mouse controls and other less touch friendly UIs. 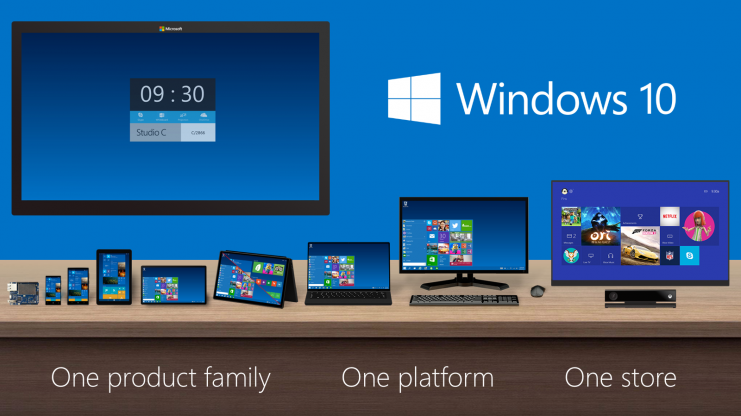 This is all set to change with Windows 10. 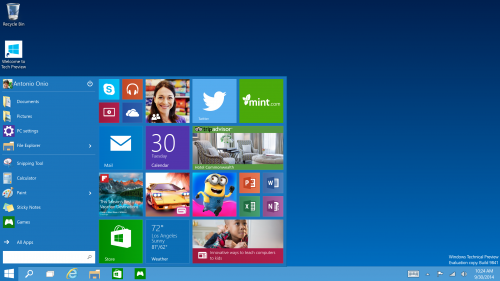 The features also make for an interesting twist with Windows 10’s new approach. For instance, with 10, Microsoft has brought back much of what defined windows 7 (or XP), the Start button. Yes, the Start button has been reincarnated. It made its way to Windows 10, tweaked to include customisable live tiles and a list of the apps installed on your computer. It does make it feel like Windows 7 and 8 came together to make a baby and called it Windows 10. This way, long time users who chose to jump ship to other platforms since the wake of Windows 8 can now turn a few heads – at least Microsoft hopes so. This is not to say Microsoft focused only on merging old features together, the biggest push was to bring Windows to all form factors and different screen sizes. This is going under the mantra “One product family. One platform. One store,” a far cry from the dreaded fragmentation that was beginning to haunt the platform. There’s a new contextual response that can be tailored to respond to your hardware. Say if you’re using a computer and you plug in a keyboard the UI will switch from the touch version of the OS to a mouse friendly UI. This includes a new “Snap Assist” UI that allows users to painlessly use multiple desktops simultaneously by grabbing apps and moving them around. Microsoft translated: What we really realized was Windows XP was the best. By making a seamless experience across all platforms, Microsoft looks to bring a sharp focus on the enterprise and consumers alike. This hits home with the recent talks with the government on “simplifying and standardising systems”. I really liked this new, somewhat nostalgic Windows. It does strike a soft balance between utilitarian and nice looks that has a lighter learning curve than the previous OS. Have something to say about the new Windows 10 or any other Microsoft product? Please share your opinions in the comments below. 1st to Comment, how nice! copy and paste into cmd awesome! Can a Non University just buy the Tablet for his personal Use? I have managed to do some digging, due to time zones (idk Washington but Louisiana has an 8h time difference), you will have to wait a little while. I personally don’t advice that you install on your main laptop or PC since it’s an early beta of the OS, so proceed with caution. I suspect that 9 was missed, to avoid confusion with 95 and 98. Sounds stupid, but they have to consider those sorts of things. I never liked Win 8 anyway. Dynamics, at least there is something on the markert u can now make choice. I heard an argument that 10 is, in spirit at least, what 8 should have been; a gentle and familiar feeling introduction to the metro/modern way of doing things. As someone who still uses XP (don’t look at me with those judging eyes!) this is good news, especially if the rumors that the final release will be free are true. Only the playful types and home users think the cool factor is an absolute necessity. But on an enterprise level where users(including directors) just want to get the job done, using the well known UI and workflow, removing the start menu was a total disaster… that also influenced Steve Balmers decision to quit. IT Depts were specifically requesting Windows 7 preloaded on Windows 8 OEM-installed computers, transferring licenses or just re-installing themselves. Finally, we have it back! I think people are over reacting at Windows 10, I think the guys critisizing Windows 10 should remeber that Windows 7 is the most successful release ever and Windows 10 also features start menu, start button just like Windows 7. Also the most hated modern UI is vanished and I think Windows 10 will be another great success for Microsoft. The people out there are just borne to criticize every good step. I’m using Windows 10 TP and I’m happy with it. I really don’t care what other think.